A while back we discussed Google’s study of the additional visits that can be gained from paid search. In short, by analyzing the accounts of a number of advertisers that paused their paid search campaigns, Google was able to determine the number of visits that were the sole result of paid search. While the original study provided insight into the amount of lift that paid search can provide to traffic levels, it did not address lingering questions concerning the amount of extra traffic gained when a site already ranks organically on the first page of versus when a site does not rank on the first page. Recently researchers at Google returned to the study to answer this very question. This time they performed a meta-analysis of 390 advertiser accounts in an effort to examine the percentage of additional paid search visits when compared to organic search results that appeared throughout various positions on the page. Logic dictates that when your ad appears in search results pages that do not contain an organic listing for your site, 100 percent of the traffic that you receive would not have been attained without paid search advertising. Researchers first examined how often organic results appeared alongside an advertisement and found that, on average, 81 percent of the time an organic result does not appear alongside an ad. 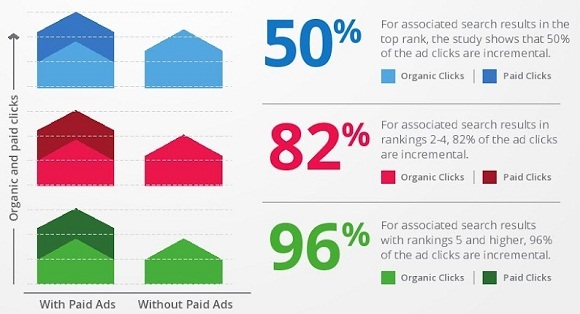 Additionally, researchers found that 66 percent of clicks from paid search did not have an organic result alongside it. Researchers then further analyzed how many clicks would have been gained when an ad appeared alongside an organic search result on the first page and came up with some surprising findings. When an organic result appeared in positions 5 or higher, 96 percent of ad clicks would not have been gained without paid search advertising. For positions 2 through 4 the additional traffic was 82 percent. Perhaps the most interesting finding was that even when an advertiser ranked number 1 organically, 50 percent of paid search clicks would not have been gained without paid search advertising. Although your website may rank competitively in natural search, there is still additional traffic that can be gained by engaging in paid search. The internet is an extremely competitive place and while a number 1 organic ranking will certainly deliver a majority of clicks, it does not necessarily guarantee traffic from all searchers. In order to gain full exposure to potential customers and clients, it is essential to take part in all applicable forms of internet marketing, including paid search. Read the full findings and research paper at Google’s Research Center.